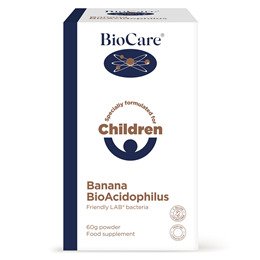 BioCare Childrens Banana Bio-Acidophilus is the ideal way to take a daily supply of friendly bacteria mixed into a pleasant tasting drink that is also free from dairy products, artificial sweeteners and colourings. From 6 months plus. It is ideal for children and the elderly who may have difficulty swallowing capsules. Additionally the product provides the nutritional benefits of real freeze-dried bananas. Lactobacillus acidophilus and Bifidobacterium bifidum are live, friendly intestinal bacteria that complement each other and help to re-populate the human intestinal tract and maintain the health of the digestive system. Vacuum packed to maintain stability and is dairy free. Fructooligosaccharides (F.O.S. ), Freeze-dried Banana Powder, Lactobacillus acidophilus, Bifidobacterium bifidum & Bifidobacterium lactis. Children 6 months upwards: Take half a teaspoon in liquid or sprinkled onto food daily or as professionally directed. Below are reviews of Children`s Banana Bio-Acidophilus - 60g Powder by bodykind customers. If you have tried this product we'd love to hear what you think so please leave a review. This is good for my little boy as he’s allergic to dairy and this has none in it. The only thing I don’t like about this product is how it’s packaged. It’s a powder form in a bottle with a stopper. It requires a 2.5ml/g measure to be used in drinks/food etc. I put it in his milk but need to mix it with a little bit of the milk first to make a paste as it doesn’t dissolve when added straight to his milk! The infantis version of this product, comes with a little spoon/measure to help dispensing it. This would be really helpful for this product. 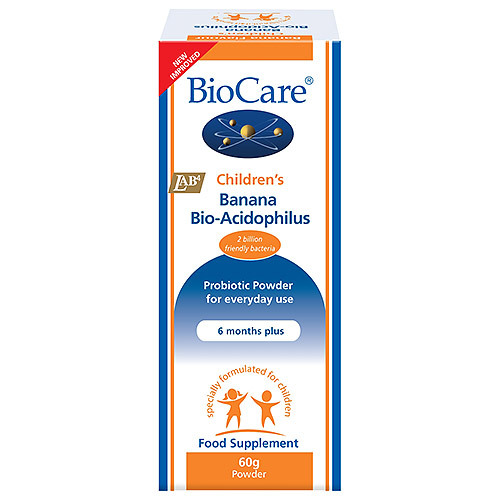 BioCare Childrens Banana Bio-Acidophilus is the ideal way to take a daily supply of friendly bacteria mixed into a pleasant tasting drink. It is ideal for children and the elderly who may have difficulty swallowing capsules. From 6 months plus.